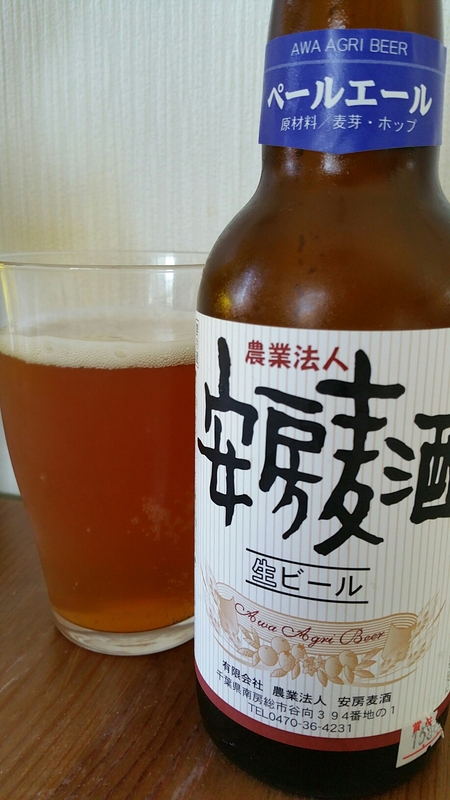 Awa Agri Pale Ale is an English style pale ale from Awa Agri Beer, based in Chiba. It’s supposedly similar to an amber ale as well according to the Awa Agri Beer website, so perhaps they have gone for some kind of hybrid pale ale / amber beer. Awa Agri Pale Ale has an abv of 5% and is available all year round. Besides that, there isn’t much information available this beer. Certainly looks more like an amber ale than a pale ale. The first thing I noticed about Awa Agri Pale Ale is that it looked more like an amber ale than a pale ale. A deep bronze colour with fairly minimal head was joined with some weird funky, buttery aromas that smelt like the beer had gone off somewhat. There was some funny citrus aromas coming off of it too but I just couldn’t get the idea of it having gone off out of my head. It wasn’t as bad as say, sour yoghurt or old milk, but it was up there and really wasn’t enticing. After checking the label (the minute paper thing in the bottom right which I could only read 1508.. I assume August 2015) to make sure the beer was in date, it was bottoms up. Oh, how I regret drinking it. I don’t often regret drinking beers, I’ll even sip an Asahi if I am at a work party (How gracious of you! -Joe), but Awa Agri Pale Ale just didn’t agree with me at all. American pale ales are supposed to be hoppy and crisp and English pale ales more malty; however, Awa Agri Pale Ale doesn’t fit into either with the buttery taste and sour notes. I actually have nothing good to say about this beer and part of me wishes I had passed it on to Joe to try. IF, and this is a big IF, you can get Awa Agri Pale Ale fresh at the source, let us know what it tastes like. Else, avoid it. Run away.